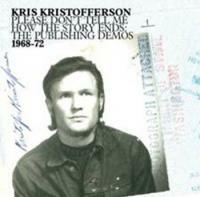 Den 14 maj släpper skivbolaget Light In The Attic Kris Kristoffersons »Please Don't Tell Me How The Story Ends: The Publishing Demos 1968-1972«. With the outlaw Highwayman's full blessing, Light In The Attic is proud and honored to present Kristofferson’s honest and upfront formative takes on the tunes that would eventually become part of the great American songbook. Since penning these numbers (many of which were written during the mid-to-late 60s while working as a janitor for Columbia Records in Nashville), over 500 artists including patron saint Johnny Cash, one-time lover Janis Joplin, and co-actor Bob Dylan (to name but three), have covered Kristofferson's material. While we shouldn't forget his vast commercial accomplishments as an award-winning recording artist and actor in more than 70 films (working under master directors like Martin Scorsese and Sam Peckinpah), it's these soul-stirring demos that laid the groundwork for his rough and tumble creative journey. Drop the needle and be transported into the intimate candle lit studio session like a fly on the wall. Please Don't Tell Me How The Story Ends: The Demos 1968-72 features comprehensive liner notes by Michael Simmons (MOJO, LA Weekly), including interviews with Kristofferson, the musicians, and other related-folks from these landmark sessions. Plus, dig into a handful of testimonials from friends Dennis Hopper and Merle Haggard. With full lyrics housed in a massive 60 page full color booklet featuring unseen photos and archival material, plus a gloriously mastered audio soundtrack (LP/CD/digital formats), you'd best crack open a bottle of your favorite trouble, sit back, and listen closely as Kristofferson relates his humanist vision in that down-home style – it’s full-blown poetry for the people.